I first learned about National Novel Writing Month (NaNoWriMo) back in 2006 when I had an English teacher who shared the project with us in class one November. I remember thinking the idea was interesting, but I never had the motivation or wherewithal to actually do it. Two years ago I was sitting in my tiny, cold apartment on the brink of my first ever Winter with a capital “W”, in a town where I had barely any friends and realized that I have a lot of time to dedicate to something like this. I’d been thinking of a book that I would like to write for a month or so leading up to the November first start date, and decided that NaNoWriMo would be the perfect time to stretch out my writing fingers. So I did it. And I completed it. Easily. It was a great feeling of accomplishment: 50,000 words in 30 days, averaging 1,667 words a day to hit that 50,000 word mark. I ended the month having written 50,586 words. 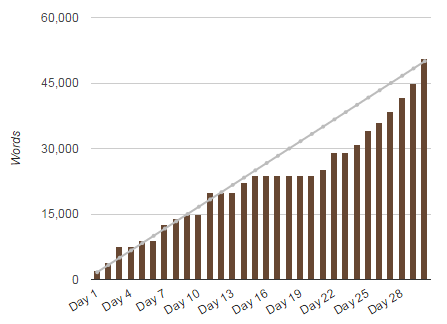 When I did NaNoWriMo again in 2013 I ended the month at 50,502.. This year I am doing it again. I had prepared myself a lot and had great ideas for books I wanted to write the last two years, but found myself bogged down in the intensely detailed stories I was trying to write. 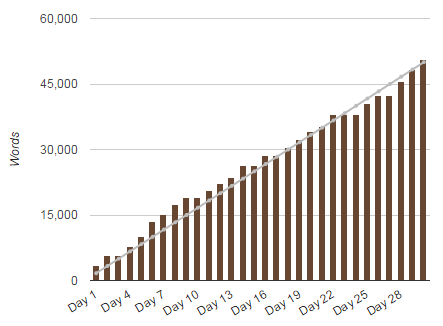 With the strict writing schedule required from NaNoWriMo it didn’t leave me much space to work out plot issues when they popped up, or build on my world if I went to an area I hadn’t yet planned. With my two years of experience I think I have a handle on how to go about NaNoWriMo, especially if you find yourself not having too much time to dedicate due to work and/or your personal life. Granted, the event has been going on for fifteen years now so I am by no means an expert, these are just things for that work for me as a more casual writer. I know people who hit 50,000 words in the first week and end the month having written hundreds of thousands of words! I cannot be productive in my apartment. It’s impossible. My apartment is a place where I relax. I don’t do any lesson planning there and I don’t write there. If I am at home I am curled up in my chair under a blanket watching some YouTube video, catching up on American television, or watching a random documentary on Netflix. My mind goes into shutdown mode at home. There have been times when I have written at home, and if I actually had a desk to sit at and write rather than an ottoman that my laptop sits on I may be more inclined to write there. But, alas, I do not have the space for a desk in my tiny Japanese apartment so I do not have one. Regardless, I think that different locations can break the slog of always sitting down to write. Take your laptop to a Starbucks and enjoy their free wifi and outlets (maybe one of the only places in Japan that has both of these). If your laptop has the battery life, take it anywhere and just write. Maybe even see if you can just go visit a friends and share what you’re doing with them. I write at school in my free time and I write in cafes. There is nothing worse than being in the groove of writing only to introduce a new character (or location) and just stop because you can’t think of a name for them. I have ruined many writing sessions because I have to stop and search for a name for my character. In the week leading up to NaNoWriMo I opened up BehindTheName.com and just refreshed their Random Name Generator. I like theirs because you can select different countries or even historical periods to get your names from. If I get bored of refreshing (which I did) I then open up a random country and jut write names I like. In my fifteen minutes of searching I ended up with a list of about 30 names that I pull from when I introduce a new character. Also, always remember that you can change a name if you don’t like it, removing the stress of finding the Perfect Name makes it a lot easier to just choose one and go back to writing. Microsoft Word has that lovely “change all” feature where you can search for a word in your document and substitute it out with another, so it is very easy to go back through and change a character’s name, even after you’ve written upwards of 50 pages! While writing every day would be ideal, I think for most people it is impossible to sit down and write anything of merit just because you have to. When I give myself the time to actually get in the mindset and just write, I can easily knock out the required 1,667 words a day in about 45 minutes to an hour. If I sit in a café for three or four hours on a Saturday afternoon, I can write 4,000 easily. And that includes random texting breaks and time spent on Facebook just clearing my mind after a chapter finishes. Last week I was extremely busy, I had a lot of classes to plan, so free time at work was minimal until later in the week, then I had three days of my part-time job (rather than two) in the evening. I was exhausted. But I knew that this week at school I would have so much free time due to exams that I didn’t worry about not being able to write much. Currently, I am very far behind, but I know that I can easily write 2,000 to 3,000 words a day (if not more) just at work, so I can easily make up the lost time. Not constantly worrying about writing all the time makes it easier. My first year I was able to write daily thanks to my work schedule being easy, but last year was much different, and I had stretches where I wouldn’t write for days yet I still finished. I think giving yourself three or four days in the week to write 3,000 to 4,000 words is perfectly acceptable and how I prefer to do NaNoWriMo. Plus during the down days I can focus on what I want to write next in my story. Because I take days off to think about where I want my story to go, I can create a list of different scenes or events I would like to write about. I was walking through a very gray, drizzly, cold November day last week and decided that I would like to write about one of my characters reminiscing about similar times related to that weather in his past whilst walking down a road. So I wrote it down on my List To Write and when I was next free I wrote about it. Sometimes a certain scene can just not what you’re in the mood to write, so I think it’s a good idea to skip it and write something new. That change of pace will refresh your mind and you can come back to the skipped scene easily. The great thing about early drafts is that you’re going to change things anyway. Things that I usually have on my list include: how two different characters met; a history explaining the certain aspect of a character; history about the setting itself; minor events that happen in the story that maybe don’t play a role overall but I feel like writing because something inspired me like a song or real-life event. Sometimes when I am just sitting on the bus or subway a scene will pop into my head and I write it down. Even if it doesn’t fully work for the story, just writing something with my characters is good for the development of those characters’ voices and personalities. Sometimes we hit a block and we just can’t think of where to take our story next. This happens to me all of the time. I actually think forcing yourself to write something can help break through that wall. Put on some moody music (high energy, intense, sad, whatever) and just write using those characters. Write something that is nonsense. Have two characters meet for dinner and discuss something. While it may not be useful to your story and you may not even use it in your book at all, the practice will help you develop the characters more and maybe their conversation will lead you to something that you didn’t think of for the story itself. To me, writing is a very organic process. I’ve written fantasy stories and I spend quite a bit of time in the prep of the world itself. Designing governments and magic systems and cultural habits. But the stories themselves I like to allow to happen more naturally. I have a basic design of where I want to go, things I want to happen, but I feel the story is more enjoyable to write when I have a loose goal at the end like “I want to write a story about self-discovery in not needing anyone to love you” and then have the story morph around that. I think one of the best things I heard from a writer was when I read something by John Green years ago. He said how 90% of his first drafts aren’t even in the books. When you break away from that mindset of perfection and following a strict outline you give yourself the freedom to let the story just happen. Relax the mind and just write. It is much easier than you think! 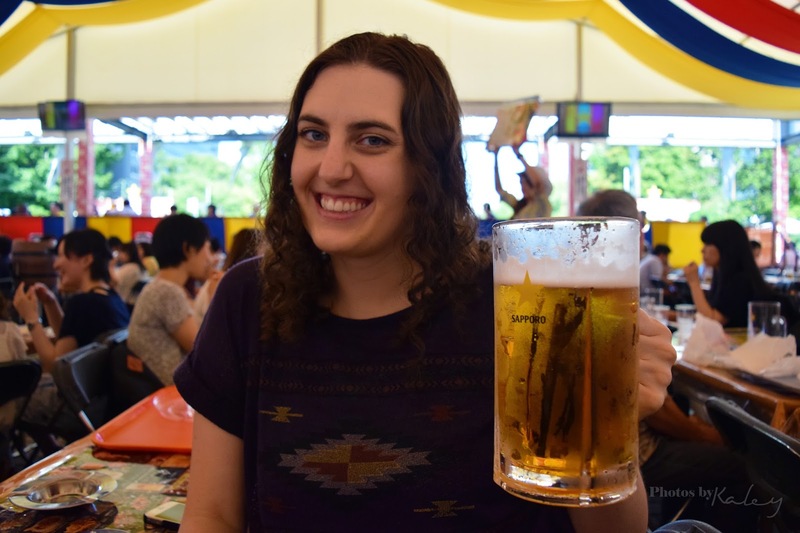 As a note, this blog post was just over 1,700 words! So 1,667 isn't so bad!